A new article from the New York Times suggests that patients should be careful before agreeing to undergo total knee replacement. Patients who suffer from sore knees and have trouble getting around may give in too quickly to the temptations of having an artificial knee implanted. The device manufacturers have created a series of computer animations and physical models to show how a new knee will change everything. After a quick operation and somewhat longer recovery, the patient is told he or she will feel years younger and be able to do all of the activities possible before having any knee trouble. As our Boston knee replacement injury attorneys can explain, this advertising push has been very effective. In 2012 alone, well over half a million total knee replacements were performed. This is more than a 100 percent increase in the past decade. However, new studies are suggesting patients may have experienced little benefit from the extreme procedure before trying less invasive techniques that may have produced better results. One of these new studies from a Virginia university examined total knee replacements in the context of a surgical validity assessment. The study determined that total knee replacement was only appropriate for patients with a diagnosis of medically advanced osteoarthritis. This involves a lot of pain and also a significant reduction in range of motion and mobility. For example, a patient with medically advanced arthritis would not be able to get out of a chair without assistance or walk up stairs. In reality, many patients who do not have medically advanced arthritis are undergoing total knee replacement procedures every year. These also tend to be younger patients who will live far longer than the lifespan of an artificial knee, even if it worked perfectly. Many of these artificial knees do not work as designed. We have seen numerous victims who have experienced extreme pain, limited mobility, and even partial or complete failure of the artificial knee. If you have been experiencing pain after having a knee replacement surgery, you should speak with an attorney who regularly handles these types of cases. This is especially true if you have been told that you will need to have a second or even third surgery to repair or replace the defective artificial knee. 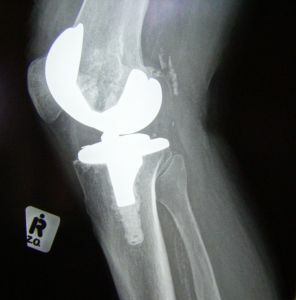 In addition to designing a defective product, many artificial knee manufacturers and surgeons did not warn patients of the known risks associated with the procedure or discuss other less invasive techniques that could have been done before having the total knee replacement performed. Failure to adequately warn patients of a known risk is one of the claims typically asserted in a defective knee replacement lawsuit. In the Commonwealth of Massachusetts, medical device manufacturers and doctors have a legal duty to warn patients of these risks. If they fail to adequately do so, this failure could be used in a civil lawsuit as evidence of a breach of that duty to warn. Additionally, your knee replacement injury attorney could assert a claim of defective design if appropriate in your particular case.